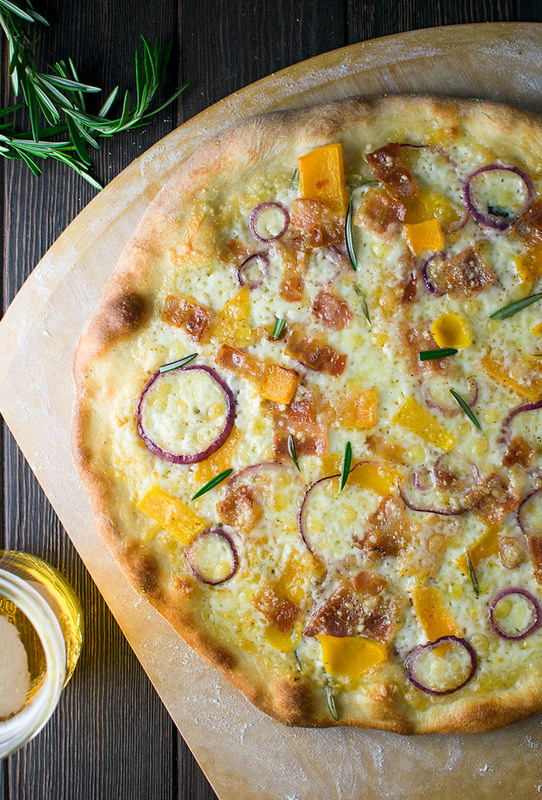 Introducing butternut squash pizza, possibly the weirdest combo of toppings for pizza, but outrageously good. 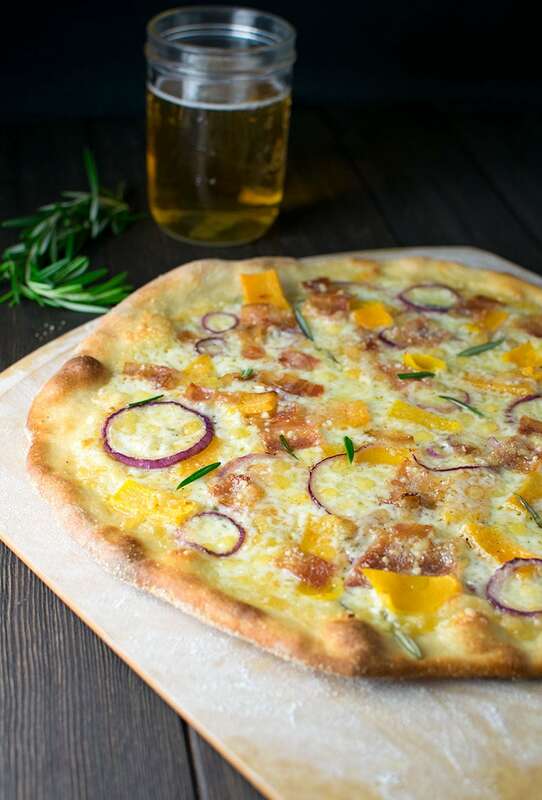 Fontina and pecorino cheese, red onions, butternut squash, bacon and rosemary infused olive oil. YES. For me, all you had to spell out was b a c o n and I was instantly sold. You put bacon on anything and you’ve got my attention. Butternut squash pizza was actually inspired by a pizza Patty and I split one night in South Boston. From the first bite we were instantly hooked and had to share it with our world. This recipe uses freshly grated pecorino cheese (similar to parmesan cheese), and fontina cheese, which is very similar to mozzarella, but with a little more flavor. Combine that with fresh rosemary, bacon, and slightly sweet butternut squash and you’ve got a savory sensation in the making. 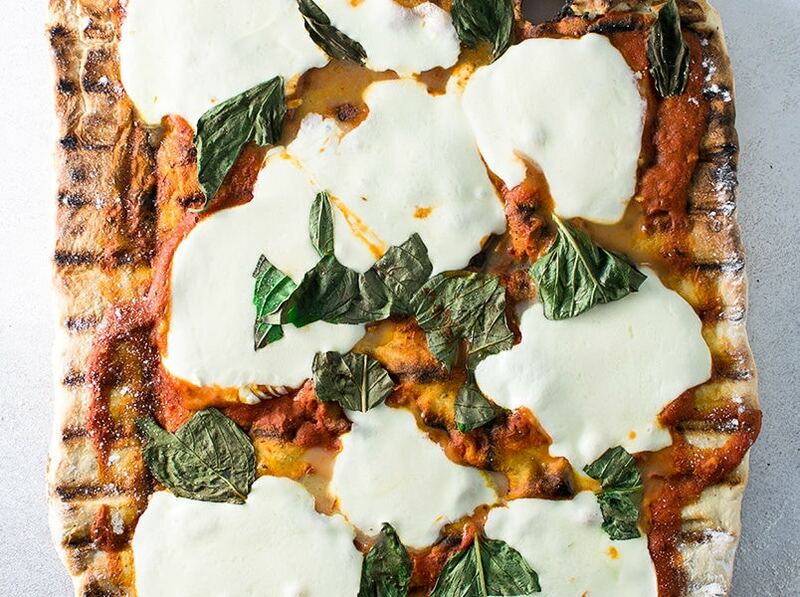 My favorite “hack” about this recipe is you don’t have to pre cook the squash before topping the pizza. The oven will cook and soften it as it bakes—a HUGE win for me if I must say. 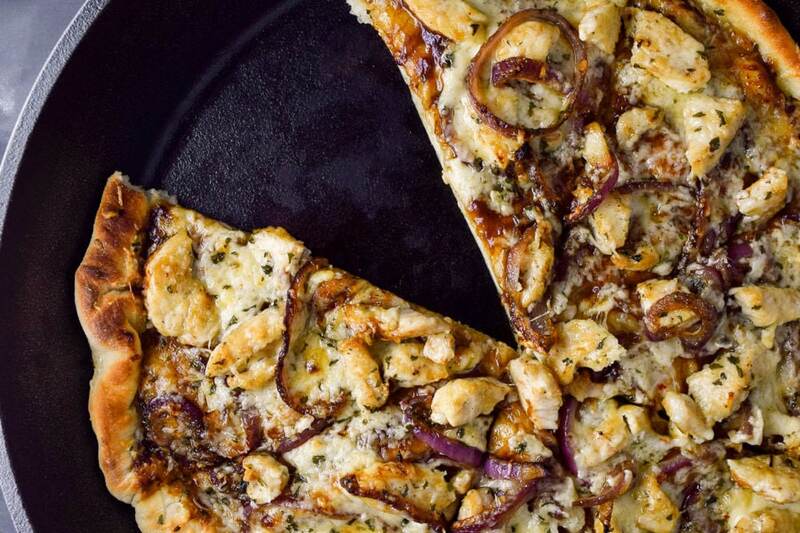 Like most of my pizza recipes, I bake using a pizza stone. Here are some tips for using a pizza stone if you want to nerd out with me. I won’t bore you with the details here if you already know what you’re doing. On a related and final note, I opted for thinner crust for this recipe. Since this pizza doesn’t actually have a sauce, thinner crust is better suited so it’s not too doughy or dry. 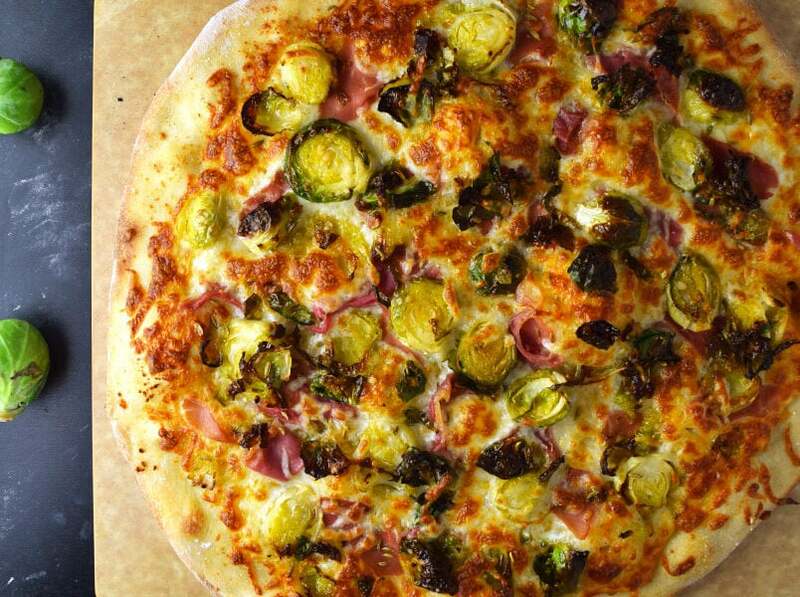 Preheat the oven to 500° F for one hour with the pizza stone in the oven (this is very important). Remove rosemary from the stem and add to a small bowl with olive oil. Let soak while the pizza stone preheats (about 20 minutes). Meanwhile, roll out the dough into a thin 12 inch crust. Place cornmeal onto the pizza peel and spread evenly to prevent the dough from sticking. Transfer the dough onto the peel. 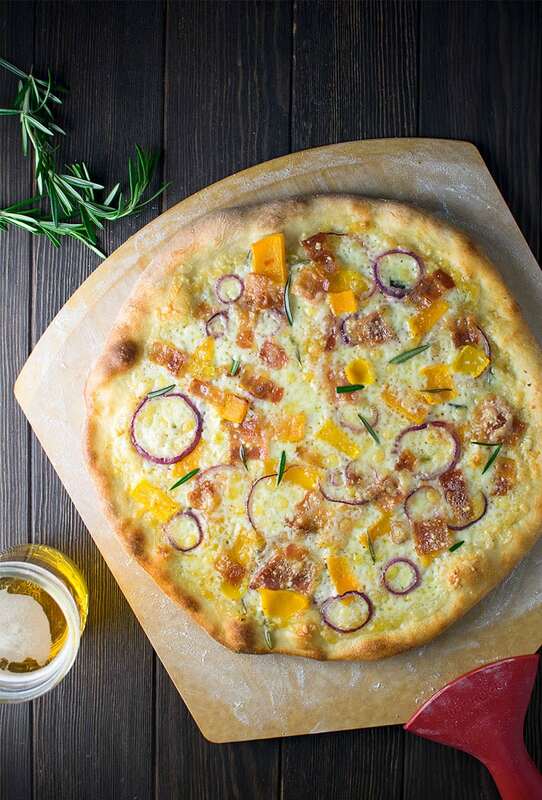 Brush entire pizza surface with a coating of rosemary infused olive oil. Sprinkle any remaining bits of rosemary on the dough. 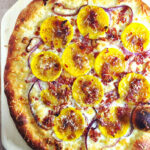 Top with grated pecorino and fontina cheese, butternut squash, red onion, and bacon. Sprinkle with a pinch of nutmeg and top with extra rosemary if desired. Slide finished pizza onto the pizza stone and bake for 10-15 minutes. Be sure to carefully watch the oven because all ovens will cook at different rates. Sometimes it will only take 10 minutes to fully cook. Remove from the oven when crust is golden brown. Let cool and serve. How do you make the crust? That seems to be the trickiest part for us!